With the increasing development of the national economy, China's modern building doors and windows industry has also entered a booming era. With the continuous improvement of the peopleâ€™s living standards, people have put forward higher requirements for the living environment. The safe, comfortable and clean living environment is increasingly favored by the general public. Doors and windows are the openings of the external protective structure of the building. They are extremely important functional components that resist wind and rain dust, physical properties such as building thermal, acoustic, and light environments, and have the effect of double decoration of the building facade and indoor environment. It is directly related to the safe use of buildings, comfort and energy conservation and improvement of peopleâ€™s living standards. It must have various functions such as lighting, ventilation, weather protection, heat preservation, heat insulation, sound insulation, dust prevention, insect protection, fire prevention, and theft prevention to provide people with a safe and comfortable indoor living environment; at the same time as a building exterior wall and indoor As part of the decoration, its structural form, material texture, surface color, and other appearance effects play an important role in the coordination of interior and exterior aesthetics and decoration. What is the role of door and window hardware in doors and windows? Luo Baihui, secretary-general of the International Model Association, believes that hardware accessories are the key components that determine the performance of doors and windows. The design of aluminum doors and windows is first of all the architectural design of the performance of doors and windows, in order to meet the functional requirements of the building as the goal, to reasonably determine the performance of aluminum doors and windows and related design requirements. The architectural design of windows and doors is based on the beautiful appearance of the whole house and the resistance to wind pressure, watertightness, airtightness, heat preservation, heat insulation and sound insulation in the area where it is located (now Beijing, Guangdong, etc.) There have been regional regulations that have required the corresponding building doors and windows to meet the corresponding requirements). 1. Physical performance indicators of doors and windows include: wind pressure resistance, airtightness, watertightness, thermal insulation, heat insulation, sound insulation, and wind pressure resistance. When the inner flat open window is under positive wind pressure; the hardware lock point is forced, so it is better to use multiple lock points. The more lock points, the smaller the force that each lock point exerts on the midline, and the less deflection of the deformation. When the inner casement window is under negative pressure: the frame is stressed. When the external casement window is under pressure: the lock point is subjected to force, so it is better to adopt multiple lock points. The more lock points, the smaller the force that each lock point exerts on the midline, and the less deflection of the deformation. When the outer casement window is under positive wind pressure: the frame is stressed. 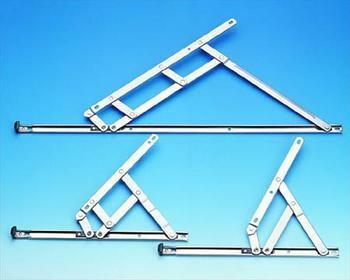 The above can be seen that the effect of hardware accessories on the performance of the first performance of the doors and windows against the wind pressure, determines the success or failure of the doors and windows; Similarly, the airtight, watertight, thermal insulation, heat insulation, sound insulation and hardware accessories are involved in the doors and windows Seal related. Hardware locks and locks are distributed around the entire door and window. When the doors and windows are locked, the lock points and the lock seats are firmly buckled and cooperate with the hinges (hinges) or the slide stays to provide a strong seal pressing force to elastically deform the seals so as to provide enough doors and windows. The sealing performance of the fan and frame can greatly improve the performance of doors and windows. Similarly, the mechanical performance indicators (opening and closing force, repeated opening and closing) of doors and windows, and other opening and closing requirements are inseparable from the requirements of hardware accessories. 2. Doors and windows are lightweight components, and its use of energy consumption accounts for more than half of the building energy consumption, which is the most important aspect of building energy conservation. The energy saving of doors and windows should be fully taken into account when designing, ie, insulation and heat insulation. If there are no multi-point lock hardware fittings, doors and windows do no better, its insulation, heat insulation can be imagined. 3. Similarly, the anti-theft performance of doors and windows is also the main concern of the owners. In this regard, the anti-theft performance of hardware accessories is particularly important in the development of smart anti-theft doors and windows. 4, doors and windows have a variety of window shapes and structural forms, and all kinds of window-type functions are dependent on the configuration of hardware accessories.